Over the past ten years, one of the missions of the Officer Down Memorial Page has been to ensure that “forgotten” line of duty deaths are properly recognized by the agencies for which an officer worked, by the appropriate state memorial and by the National Law Enforcement Officers Memorial in Washington, DC. A “forgotten” line of duty death is an officer who died in the line of duty in the past, typically far in the past, whose death is not currently recognized by the agency for which the officer worked and/or does not appear on any local, state, or national law enforcement memorials. The researchers at the ODMP have spent a lot of time conducting historical research into line of duty deaths, some dating back to the early 1800s. The ODMP has uncovered and confirmed the line of duty death status of 839 forgotten officers. 275 of these officers have been accepted by their agencies as line of duty deaths and their names have been added to the appropriate memorials. 564 of the newly discovered line of duty deaths are still pending review by their agencies, but have already been added to the ODMP. In addition, the ODMP is still researching several hundred forgotten deaths to confirm their line of duty death status. Newspaper research that reveals information about an unrecorded death. Basically a researcher looks though old newspapers looking for any articles on possible line of duty deaths that have not be recognized. Discovery while doing research into known line of duty death. Most of the time this happens when another (unrecorded) line of duty death is mentioned in an article or on an adjacent article while researchers are obtaining information on another death. Submissions from ODMP visitors, such as descendants or law enforcement personnel. When a possible forgotten line of duty death is uncovered, the ODMP volunteer begins by identifying the location of the incident and any local newspapers that were published at the time of the incident. The researcher will then begin with the newspaper research. That may require requesting microfilm through inter-library loan, or traveling to a location to review the relevant newspapers. The researcher will then backtrack in the newspaper from the date of death of an officer, to find the first article that mentions the incident in which the officer was killed. Again, that could be the previous day, or it could be six month, a year or even more into the past. As the researcher searches through the newspaper back to the date of original incident, he will copy each article that mentions the officer in question. The researcher will then move forward from the date of incident and locate any articles related to the death, including the trial of any perpetrators (when applicable). This can sometimes take the researcher years from the original incident date, but not always. With the older line of duty deaths, the task of find out the outcome of any trials may not be as hard as it sounds. The justice system moved much quicker in the past, and many times a cop killer was tried, convicted and executed within months of the original incident, so the articles are not spread over a long period of time. In order to fully document an incident and confirm the circumstances, the researcher will try to locate articles in at least two different newspaper publications from the area where the incident took place. In large towns or cities that is normally easy as many larger cities have multiple newspapers being published in the area. In some smaller towns or rural areas, it may not always be possible, due to the lack of newspaper coverage. Next, a researcher will try to find any Department records that an agency may have about an officer’s death. Many times an agency has records they don’t even know about, stored away in a basement in an old log book that has not been looked at in decades. The death of Sergeant William Hurley, of the Oyster Bay Cove, New York, Police Department, was uncovered in late 2003 by the ODMP. His name was added to the New York Sate Police Officers Memorial and to the National Law Enforcement Officers Memorial in May 2005. 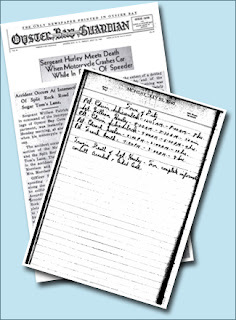 The ODMP researcher was able to obtain numerous newspaper articles about his death from both small-town and national newspapers. A search through old department logbooks from 1940 also turned up an entry referencing his tragic death. The logbook was found in the records room of the Oyster Bay Cove Police Headquarters and helped to confirm what newspaper accounts had said; that Sergeant Hurley died in the performance of his official police duties. The next step in the research process is to obtain a death certificate or a death ledger entry for the fallen officer. The process to locate that is different in each state, and sometimes even varies by locality. The best way to locate a death certificate is online. By using a search engine to locate the vital records office for a county, a researcher can usually get the information they need quickly as to how to obtain a death certificate. Normally there is a fee to obtain a death certificate, and each vital records office has different rules and regulations as to who they will release a death certificate to. Once all the documentation is gathered up, the researcher can determine if the officer’s death qualifies as a line of duty death, based on the ODMP criteria for inclusion. Each death the ODMP discovers is evaluated against the criteria. If an officer is determined to be eligible for inclusion, a memorial will be created on the ODMP. Finally, the researcher will work to have the officer officially recognized by his/her agency and added to local, state and the National Memorial. Copies of all documents located will be turned over to the agency and the researcher will assist with filling out the necessary applications for any state memorial that might exist and for the National Law Enforcement Officers Memorial, so that all that an agency head needs to do is review the documents, sign the application, and mail it to the appropriate memorial. Unbelievably, this is generally the most difficult task to get accomplished!